Mr ALBANESE (Grayndler) (10:56): I rise to recognise Thehidden billions report compiled by Oxfam Australia in June of this year. In 2014 it is estimated that tax-dodging multinationals operating within this country shifted $19 billion in profits offshore, depriving the Australian public of approximately $6 billion in tax revenue. This is money that could have gone into essential public services such as schools and hospitals in this country, or could have gone towards nation-building infrastructure. Furthermore, the report commissioned a poll that revealed 90 per cent of Australians want this government to prevent all multinational corporations operating in Australia from moving their profits to tax havens overseas in order to avoid paying their fair share here. There is a real human cost to this practice, both at home and abroad. Multinational corporations based in Australia and operating overseas are responsible for depriving developing countries of tax revenue. Large developing countries such as India and Brazil, as well as neighbouring countries such as Papua New Guinea, Indonesia, Thailand and the Philippines, are being starved of millions of dollars in tax revenue, and Australian-based multinationals are part of the problem. In the Philippines an estimated 1,700 new classrooms could be built per year up to 2020 with these concealed profits. Over the next five years Oxfam estimates that Indonesia will be deprived of US$360 million that could go towards education, and Papua New Guinea, one of Australia’s poorest neighbours and a recipient of substantial investment from Australia, stands to lose around $17 million in expenditure that could go to providing essential services like health and basic infrastructure. If more is not done to close tax loopholes, the report estimates that tax-dodging Australian based multinationals will deprive developing countries of a further $2.1 billion in public education and $1.5 billion in health, water and sanitation services. Oxfam is calling on the Australian government to make transparent the tax affairs of large multinationals. This means modifying current legislation so that multinational companies which function in or from Australia report publicly on their incomes, employees, profits earned and taxes paid in every country in which they operate. This will make it harder for multinationals to hide their profits in offshore tax havens—in turn, providing much needed revenue to develop essential public services for both Australia and for our developing neighbours. Mr ALBANESE (Grayndler) (13:44): I rise to raise my concerns about the latest stage in the WestConnex project, which has been characterised by poor and ill-conceived planning. The latest suburb potentially to suffer is Leichhardt. Local residents are concerned that a site on Darley Road in Leichhardt will be the midpoint for tunnelling for the extension of the WestConnex project. Darley Road is already a very busy road. There must be proper consultation with local residents and proper planning, including a local traffic plan, to satisfy residents that there will be no adverse impacts on them. Of even greater concern is that the nearby Blackmore Oval and/or other public space in the area will be used during construction. Active and passive open space is at a premium in my electorate. Blackmore Oval is used by a variety of sporting codes for local sport. In addition, the Canal Road Film Centre is situated behind Blackmore Oval. This centre houses 75 or more specialist businesses that comprise a big part of the Australian film industry infrastructure, which is important for our national economy. I have spoken to the federal minister responsible for urban infrastructure about these issues and have had two direct discussions with the appropriate state minister, Duncan Gay, and called on him to ensure that these issues are resolved and that Blackmore Oval is protected. Today I contacted Minister for Infrastructure Darren Chester to offer bipartisan support for action to ensure cruise ships on Sydney Harbour use low sulfur fuel. I offered Mr Chester full co-operation to address news that federal anti-pollution legislation passed in January had the unintended consequence of rendering inoperable the NSW Government’s new requirements on the use of low-sulfur fuel (0.1 per cent or less) on the harbour. Residents of Balmain have expressed legitimate concern about fuel fumes from cruise ships in White Bay and it is important that the Commonwealth act to address this situation as soon as possible after the July 2 election. I offered to work with Mr Chester to support any Commonwealth action to resolve this issue through legislation or through the designation of the International Maritime Organisation. Cruise ships provide significant economic activity for Sydney. But it is important that they operate with environmental best practice. I am pleased that the cruise ship industry has agreed to voluntarily implement the NSW Government policy of using low sulfur fuel. Commonwealth action is required to ensure this continues. This issue should be above politics. Mr ALBANESE (Grayndler) (10:00): Last Saturday, I attended a public meeting in Rozelle, following an invitation by a member of the Annandale WestConnex Action Group who came to one of the street meetings that I regularly hold on Saturday mornings. It was an expression of concern by the community about the lack of proper planning for the WestConnex Project and particularly the impact it will have in Rozelle. At the moment, it is unclear how many, if any, houses will be resumed, as has occurred in Haberfield. It is unclear where the route will go. It is unclear where any exhaust stacks will be placed. And that uncertainty is creating enormous concern in my local community. This is an example of planning gone wrong. The WestConnex Project has been funded before the planning or the business case have been conducted. We established Infrastructure Australia to get the process right—do the planning, do the business case, then receive the funding—to make sure projects actually achieve outcomes. And yet in last night’s budget it was confirmed that Infrastructure Australia’s budget will be cut by 25 per cent—precisely the wrong direction. Infrastructure New South Wales identified freight to Port Botany as the priority for roads and rail in terms of Sydney’s urban congestion challenges. The WestConnex Project solves neither. The WestConnex Project of course goes to St Peters. I wrote to the WestConnex Delivery Authority chairman, Tony Shepherd, saying this: ‘From what has been published, the proposal to widen the M5 and dump traffic at St Peters interchange is absurd. The notion that delivering additional traffic to King Street, Newtown, and parallel congested back-routes represents proper planning is beyond belief.’ I wrote that on 9 November 2014. It appears that the same mistakes are being made with the rest of this project. That is why I have requested an audit of the entire WestConnex Project, as well as of the government’s infrastructure plans, because it is clear that—with regard to the East West Link fiasco, the collapse of Perth Freight Link in the courts and the blow-out on WestConnex from $10 billion to $16.6 billion—this is a failure of government planning, which is why the national Auditor-General should conduct an audit into the government’s infrastructure programs. Mr ALBANESE (Grayndler) (15:17): On indulgence: Mr Speaker it is perhaps not known as broadly in the community as it should be that you are visiting electorates in order to visit schools to promote the parliament and to promote the important role that democracy plays. 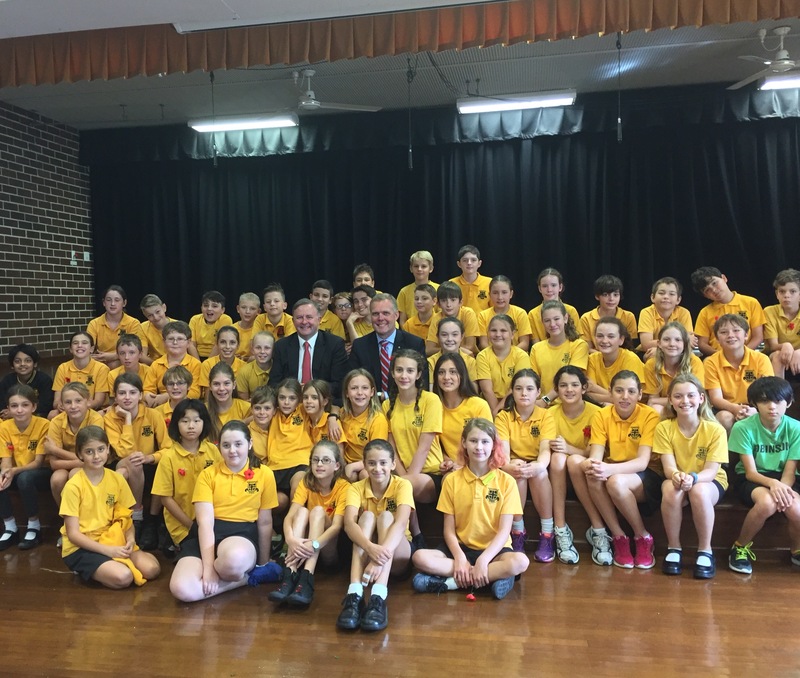 I was very grateful to welcome you to Birchgrove Public School newly in my electorate, now currently in the electorate of the member for Sydney, last Thursday to address years 5 and 6. I think it is a very good thing indeed that you are using your role as Speaker to promote the parliament to young people not just when they are here but outside. On behalf of not just me but I am sure all members of this House, we thank you for the constructive role that you have played and the way that you have brought dignity to that office here and outside. Thank you. MR ALBANESE (Grayndler) (11:42): Urbanisation has changed our way of life. Four out of every five Australians live in our cities. By 2031, our four largest capitals, Sydney, Melbourne, Brisbane and Perth, will have increased by 46 per cent. The other capital cities, including the nation’s capital, as well as Adelaide, Hobart and Darwin are expected to grow by nearly 30 per cent. I support urban renewal and I also support appropriately increasing density in our cities. But, as Danish architect Jan Gehl said, ‘First life, then spaces, then buildings—the other way around never works.’ Hence the concern that I have about the Sydenham to Bankstown Urban Renewal Corridor and the Parramatta Road Urban Transformation Strategy. I am concerned that there has not been appropriate community consultation in a meaningful way on these proposals. I have met with local groups including the Save Dully Action Group, Save Marrickville, Help Save Lewisham, and the Hurlstone Park Association amongst others. They have been out in their neighbourhoods making sure that people have the information that they need and coordinating a community response. I have also raised my concerns directly with the New South Wales planning minister, Rob Stokes. Community engagement should be at the core of any change to people’s neighbourhoods. What we have here is a considerable proposal that will change the character of many of the suburbs. We need to make sure that we get planning right, that community services and infrastructure are in place to deal with increased densities. There are examples where it can be got right and examples where it is being got wrong right in my local neighbourhood. An example is a recent new development in Dulwich Hill on Wardell Road, right near the station. It is a box with a couple of windows on the side. It has no character. It is a considerable increase in density and an eyesore that has brought nothing to the character of our local community. In my view, it is an inappropriate development that has undermined support for increasing density. There are other cases—even some that were controversial at the time—where it has been done properly. For example, the old Marrickville RSL site on Illawarra Road near my electorate office, right next to Marrickville station, is a considerable increase in density but it is appropriate. Right next to the station, it is appropriate that people have that rail access. We need to make sure that we have appropriate green buildings—that we bring in renewable energy, water recycling and appropriate development that takes into account the need to also have open space and recreational facilities so that there is an improvement in the quality of life. I look to examples like the One Central building on Broadway. Again, it is a considerable increase in density but an appropriate development which has open space and therefore can bring the community with it. If there are simply lines done on a map in way that does not have appropriate community consultation and where there is, in some circumstances, overdevelopment and no accounting for community space and facilities, then the support for increased density will simply not be there. Urban renewal does bring great opportunity. It is a chance to address issues of inequality associated with drive-in, drive-out suburbs as well as to tackle the growing problem of congestion, given that a lot of the jobs growth has been in the inner suburbs of our communities. But we need to make sure that we get it right. We have one chance to get it right. I call upon the New South Wales government to do much better and to have appropriate consultation that is meaningful and that can change the draft plans where they need to be changed. At the moment it is very clear that there is some inappropriate development whereby there will be an increase in traffic congestion rather than an improvement in the quality of life for people directly affected in my local community by these proposals. Mr ALBANESE (Grayndler) (09:43): Many of my constituents have contacted me over the past months, concerned by the recent reports of animal cruelty and mistreatment by some in Australia’s live export trade. Many of these same constituents want to see the member for New England, the agriculture minister, use the statutory powers he already has to prosecute those who breach our export laws. Labor introduced these powers through the Export Supply Chain Assurance Scheme, or ESCAS, in 2011. This reflects Labor’s commitment to see animal welfare maintained throughout the live export process both in Australia and overseas. The regulatory regime we created forces exporters to show they have a plan to treat animals humanely and provides a monitoring and auditing system all the way from port to abattoir. Heavy sanctions and penalties can be applied for breaches of ESCAS. These range from financial penalties, the suspension of an export licence, the cancellation of a licence—or indeed imprisonment. These provisions are currently available and it is up to the minister to examine the recent allegations that have been made about breaches of these rules and take action where necessary. When last in government, Labor took the strong decision to suspend exports to Indonesia while supply chain welfare assurances were sought. This was a significant decision for Australia to take, as we have been exporting livestock for over a hundred years. Prior to the last election, Labor also committed to appointing an Inspector-General for animal welfare and live animal exports as an independent statutory officer to oversee the ESCAS. Labor remains committed to the position. Unfortunately, the coalition government has failed to implement this important and independent position. Labor has also recently proposed that the minister provide regular reports to the parliament. The minister’s report should place on the public record an easy-to-access and understandable account of the state of the sector, any animal welfare incidents, and how they have been dealt with. I want to see effective welfare provisions in place. It is currently up to the agriculture minister to explain why he has refused to introduce the additional checks that the former Labor government proposed. The agriculture minister must also outline how he will meet his ministerial responsibilities in ensuring that animal welfare is maintained in the industry. I look forward to joining Fraser Park Football Club in celebration of their 50 year anniversary tomorrow night at their premises. Fraser Park FC has a remarkable history, and owes its origins to a handful of Portuguese migrants who were so passionate about football that they started a club. Today their legacy lives on and Fraser Park in Marrickville is the Club’s home. Over the years, Fraser Park FC has cemented its place in the local community and has supported generations of talented players. Football is an important part of our Portuguese community and we are fortunate to have such a dedicated club like this in the inner west. I am proud the former Federal Labor Government was able to support the growth of the club, providing $2 million for the redevelopment. More kids than ever are participating in sport in the Inner West and this is only possible because of clubs like Fraser Park FC. I want to congratulate President Antonio Cerqueira and the Fraser Park FC Committee, as well as their volunteers, on their many years of hard work. Mr ALBANESE ( Grayndler ) ( 11:44 ): The Cooks River winds its way through the inner west as the southern boundary of my electorate of Grayndler. On a pleasant day, the local parks neighbouring the river overflow with families and friends. People walk their dogs, cycle down the designated park which runs alongside the riverbank or take their kids to the water park that was established by Marrickville Council just a short time ago. But it was not always this way. For a long time the Cooks River had a reputation as one of the most polluted rivers in Australia. Restoration began in the 1990s, and there has been a great deal of progress since then. Indeed, I was proud when in 2010 we delivered, in government, $2 million to assist with funding to help revitalise the river. Today the Cooks River is growing in health, and I want to congratulate in particular the councils—Marrickville Council and Canterbury City Council—the Cooks River Alliance, the Cooks River Valley Association and the Mudcrabs, for their determination in restoring this waterway. For decades these organisations have coordinated clean-up efforts, educated our local community and advocated for funding to revitalise the river. These organisations and particularly those volunteers in them have spent literally years of their lives dedicating themselves to improving this natural environment. It is an example of how hard work by the community can make a difference. It shows the immense value that local communities attach to their urban waterways. As our cities continue to grow we need to give more thought to our waterways and to the role that they play in our neighbourhoods. Waterways make up the veins of our cities and contribute to the productivity, sustainability and liveability of our local communities. A national government which has nothing to say about cities has nothing relevant or enduring to say about the nation or the nation’s future. Whitlam’s assessment of the importance of cities to life in this country is even more relevant today than it was in 1972. It has now been just over a year since I put forward Labor’s urban policy agenda at the National Press Club. I spoke about 10 ways that the national government can provide leadership in urban policy in cooperation with other levels of government, with industry and with the community. One of the ideas I put forward is that we need to enhance sustainability and resilience of household and industrial water supply and rehabilitate our urban waterways. For too long these urban waterways were used for industrial waste, and I do find it concerning that the Prime Minister, Malcolm Turnbull, has given the water portfolio to Barnaby Joyce. While water management in rural and regional Australia is of the utmost importance, our inland waterways matter too. I am of the view that water policy should be determined on the basis of science and outcomes, not abandoned as part of a political horse trade. The federal government must advocate for an integrated approach across planning, transport and infrastructure when it comes to dealing with the challenges of urbanisation, but part of it has to be dealing with water. That is why, when Labor launched Australia’s first national urban policy in 2011, Our Cities, Our Future, the policy spoke about water management and waste management as a critical part of the bigger picture. Labor’s policy platform adopted at our national conference provides a strong framework for improving the productivity, sustainability and liveability of our cities, where four out of every five Australians live. Management of our urban waterways, water recycling and water management in our cities is a critical part of making sure that Australia becomes the sustainable place that it should be, particularly as our cities grow into the future. This week I spoke in the Parliament about the WestConnex project, calling on the Baird Government to release the business case. On Thursday of last week Labor’s leader, Bill Shorten, outlined our plan for infrastructure in Australia. In his speech the Leader of the Opposition recognised that in order to generate economic growth, in order to generate more jobs and in order to generate more liveable cities and regions that are connected we need more infrastructure. In spending taxpayers’ money on infrastructure we need to do it in a transparent and responsible way. That is why we established Infrastructure Australia, making sure that projects stacked up in a transparent way and that those projects were funded that would produce the greatest return to the national economy and to the improvement of the living standards of the Australian people. That is why we have been very critical that projects that had been through the Infrastructure Australia process, including the Melbourne Metro, the Cross River Rail project and the Managed Motorways program, were all cut, as well as projects that had not had published business cases funded, including the East-West Road project in Melbourne, the Perth Freight Link and WestConnex in Sydney. The WestConnex project, of course, is connected to my electorate. I am in favour of roads. I do not believe that you can have just public transport. But I am also in favour of public transport, because I do not believe you can just have roads. You need to have an integrated transport system in order for cities to function properly. In relation to WestConnex I agree that people travelling from Western Sydney need an improved M4, that the current circumstances whereby it just stops at the T-junction and traffic is funnelled onto Parramatta Road is not acceptable. But this project will not meet its objective, and I am concerned that it could add significant congestion where WestConnex meets the local street network. What concerns me is that it is unclear where the traffic will go once it reaches the St Peters Interchange. There are also concerns for the residents of Haberfield, Rozelle and Annandale about the traffic implications of the extended M4. We do not know where the exhaust stacks will be, and we do not really know the impact the project will have on these suburbs. The other thing that concerns me is that governments are investing millions of taxpayer dollars on this infrastructure but the decisions have not been transparent and we do not know whether they are based on a business case that stands up to scrutiny. In fact, when in government Labor funded $25 million for a study to ensure that the business case into any improvements on Sydney’s road network, particularly getting freight to and from the port, was complete and transparent. We are yet to see the result of that study. But that when governments spend scarce dollars they ought to be certain up-front that they get it right and that the investment delivers on the desired outcome. I wrote that under the current design WestConnex was ‘a road to a traffic jam’. That was nearly 1½ years ago, and we still do not know whether they have it right, and it still looks like being a road to a traffic jam. With the WestConnex project we are told that the business case has been done, but I call on the Baird government to release the business case to public scrutiny. In December 2014 I called on the premier, Mike Baird, to release the full business case after the Audit Office of New South Wales report identified serious deficiencies in the planning and quality assurance processes surrounding the project. While the New South Wales audit did not address the issue of value for public money, it identified serious deficiencies in the project planning and evaluation. The plan that has been done to date does not demonstrate the benefit to the public. I am concerned about where the cars that travel to the end of the interchange are going to go and the impact that will have on our local community. Cars will be transferred onto local streets that are already congested. They will impact on the traffic on the exciting main street of Newtown. We are told that there will be no clearways in King Street, and I have spoken to the New South Wales minister, Duncan Gay, and got an assurance that that will be the case. But we need to make sure that that is made absolutely certain, otherwise the Newtown CBD will be impacted adversely—with consequences for jobs and for economic activity. The Newtown shopping area is the most-visited shopping, food and entertainment area outside the CBD. This is an interesting, active and energetic area, and it has a great sense of community. This has partly built up by people using the main street and walking around the area. They see their neighbours, talk to each other and the community is built. While we have been told that there will be no clearways, WestConnex is not in control of what happens in the local streets. So we need to make sure that it occurs, because the RMS is not part of this project. The WestConnex project stops and the RMS takes over. I have not seen—and the local people have not seen—any plan from the RMS to show that it has the flow-on traffic organised. Likewise, traffic could be channelled onto Campbell Street in St Peters. Anyone who has a look at that street and then into Edgeware Road in Enmore knows that the consequences of this are quite bizarre—to suggest that this will be a major thoroughfare that will then just stop at that intersection. No wonder the local community is concerned. The other thing which appears not to have been considered by either the RMS or the WestConnex Delivery Authority is the integration of roads and public transport. The former prime minister, we know, had no interest in public transport. However, when planning major infrastructure road projects it is incumbent on the planners to ensure that, where possible, roads and public transport are integrated. In a city of the size of Sydney, which is continuing to grow, we must plan to ensure that we are not continually putting more cars onto our roads. It just leads to further congestion. We need to plan to enable the use of public transport and active transport to promote sustainability and liveability in our cities. There is no evidence to date that these issues have been considered or planned for in any serious way by any of the relevant authorities. Part of the problem, of course, is that there are so many different authorities; it is very hard for the local community to be able to engage in proper community processes. The WestConnex Delivery Authority website shows cute little icons that tell us of the jobs to be created, the apprentices who will be trained, that drivers will save 40 minutes from Parramatta to the airport, that urban renewal will occur and that traffic will be removed from local roads. But it does not pass proper scrutiny. Anyone who goes to that area around the St Peters interchange knows that it is already a massive struggle to get from there either to the airport or to the port. Increased traffic flow into this area, where you have the largest residential growth occurring anywhere in Australia—around that South Sydney area—means gridlock. The New South Wales government really needs to explain far better what will happen to the traffic once it leaves that interchange. While traffic will be removed from local roads in some areas, it will be transferred onto the narrow streets of the inner West and the inner city. Of course, as we know, the greatest way to have urban renewal is public transport. Have a look at projects like the Regional Rail Link in Victoria and you can see how successful urban renewal projects can be. This is, of course, a state government project. It is partly funded by the federal coalition government, but it is managed and operated by the state government. It has a responsibility to give the community information, to give assurances that they can rely upon, to show the community the plan for dealing with the traffic that arrives at the end of the WestConnex route and, importantly, to show the business case. I think communities are prepared to accept some disruption for infrastructure development. What they will not accept is that disruption when you have no business case and no transparency in the process, and providing those things is what the New South Wales government must do when it comes to this project.